I am addicted to the TV show, Eureka. The show is part science fiction, comedy and serious drama with affable characters that I know I’ll miss once I’ve seen all the episodes. The town of Eureka is filled with geniuses of every discipline all working for Global Dynamics- a secret government think tank and an inventor’s paradise. All of the inventions that we’ve ever dreamed about are being tested in this town. Except, it seems, they don’t care about their coffee. Twenty years ago, they sent a space ship into the far reaches of the universe. The computer is an organic computer that is made from cells. When the space ship reached storage capacity, it has been programmed to do what is needed to survive and continue. Therefore, the space ship/ computer created a human version of itself where all of the cells within the organic human computer contained billions of lines of data. They are testing a large rock that is a piece of the original universe’s Big Bang. During another episode, they designed a jacket that allows them to walk through walls. They have learned how to move from dimension to dimension. If you’re pregnant, there are clothes that are able to hide your pregnancy. There’s no need to buy new clothes for your baby- there are clothes that continue to grow with the baby. All of their cars are computer driven and according to the main characters on the show, we have already colonized Mars. They have learned how to create enough water in a single water bottle that would supply a colonization on any planet. If you aren’t addicted to the show, you’ll worry about my mental health. However, here is my problem. With all of the technological advances that have occurred in the fictional world of Eureka, why, oh why, do they still make their coffee in a primitive way? For example, they pour their drip?!?!? coffee out of glass carafes! If more advanced lifeforms arrive in our world, when they see the glass carafes, they will destroy us immediately. Brewing coffee in a drip maker into glass carafes that remain on the heat for 30 minutes or longer kills the flavor of the coffee. Why aren’t there any futuristic coffee brewers in Eureka? I know that I sound insane, but when you’re capable of stopping time, your home’s computer cooks elaborate meals for you, I would expect that your coffee is not brewed in a drip coffee maker. Why aren’t they growing and roasting coffee in Eureka? They have learned how to grow a 50 foot tree, or reforest, ahem, a forest in a few minutes. Really. They grow everything there, but no coffee? 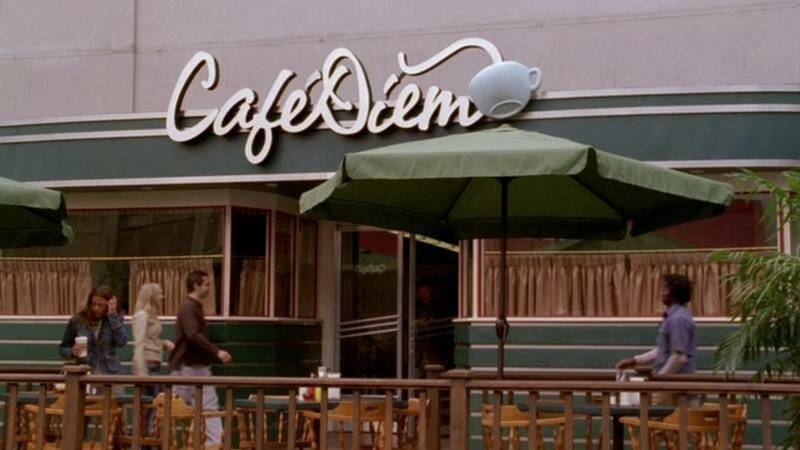 In Eureka’s meeting place, the cafe/restaurant Cafe Diem, if you’re a coffee forensic scientist, you’ll see one of the worst sins of humankind. The espresso grinder has beans filled to the top. In addition, it’s a standard looking espresso grinder. Having the beans in the hopper for a prolonged period of time makes the coffee stale. Why wouldn’t they have some kind of laser that grinds that coffee perfectly. The grinder would take into account the flavor possibilities that would occur with different grinds and would monitor the humidity in the room to make sure that each shot was perfect. Vacuum Syphon Brewer at Chazzano Cafe, not Cafe Diem! We don’t even see any Vacuum Syphon Brewers in Eureka. All of the scientists would absolutely love that kind of brewing style. But what do they have? Just a drip coffee maker and a standard espresso machine. It’s not even a fancy, futuristic espresso machine. How could Chazzano Coffee Roasters look more futuristic than Eureka‘s Cafe Diem? The greatest sin that occurs on Eureka is the consumption of flavored lattes. Even at primitive, non-scientific Chazzano Coffee Roasters, we are able to roast the coffee to bring out the natural flavors of the coffee. Here’s the coffee menu at Cafe Diem, their central meeting place: Cirillium latte, Chromium Kona Latte, Vinspresso (espresso beverage created by the shop owner, Vincent), and a Mocha. How could such an advanced society have Kona as their best single origin coffee? It’s great, but our love for it is influenced by its unnatural price. There are other coffees that I’d rather have on my lips before my last breath on this world. In addition, how could they offer a Mocha drink in an advanced scientific world where they could bio-engineer the flavor profiles of the coffee bean to produce whatever notes they desired? I guess we can all rant and rave about the portrayal of services, products, or professions about which we are knowledgeable. Often, I am embarrassed by the portrayal of Jews and the lack of knowledge that Jewish screenwriters have about their own religion. But, a futuristic world that brews coffee in drip makers into glass carafes? That just hurts my soul. Frank is a coffee roaster, businessman, and author who dreams about having Chazzano product placement on his favorite TV shows.